Perhaps more than any other region of India, Karṇātaka can claim to be yoga-bhūmi: the Land of Yoga. Those who are familiar with the history of modern postural yoga know that the forms now practiced worldwide were codified by T. Krishnamāchārya in the mid-1930s in Mysore, Karṇātaka. Yet our earliest certain evidence of the worship of Śiva, Lord of Yoga, is also from Karṇātaka — 1,800 years earlier. We also know that yoga flourished in Karṇātaka throughout the medieval period — using the word yoga in its traditional meaning of 'meditation' and 'disciplined psychophysical practice aimed at a spiritual goal', of course. The Jaganmohan palace, where Krishnamāchārya codified modern postural yoga. There is a place — a place devoted to the observances of Śaiva saints, a place for the quiet study of the four Vedas, a place where commentaries are composed on the various systems of spiritual philosophy, including Sāṅkhya, Buddhism, the Kālamukha doctrine, Patañjali's Yoga-science, and more . . . a place for (studying) the eighteen Purāṇas, the legal literature, and all the poetical compositions . . . a place where food is always given to the poor, the helpless, the blind, the deaf, and to professional story-tellers, singers, musicians . . . and to Jain and Buddhist mendicants, to brāhmanical ascetics, and to [Tantrik] haṃsa and paramahaṃsa ascetics . . . a place where many helpless sick people are harbored and treated; [in short,] a place of assurance of safety for all living creatures. May he, Śrī Keshava, always grant you the results you desire. As the translator of this verse, Elaine Fisher, comments: "This verse captures a pervasive motif of [Indian] religious thought: one particular [form of] God, revered by a community of devotees, encapsulates in his—or her—very being the entire scope of divinity. . . . . this verse has circulated widely, accruing variants here and there, as a fixture of devotional liturgy across communities." 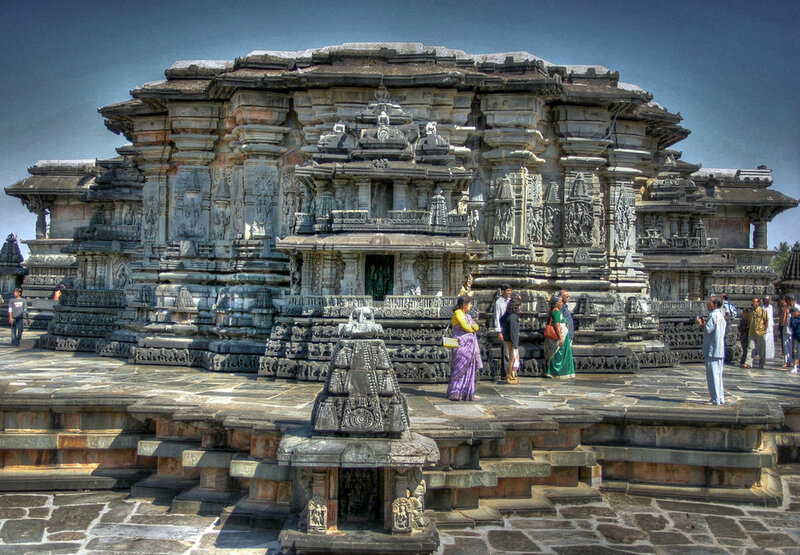 The Chenna Keśava temple in Belur, Karṇātaka. The deity here is said to grant the wishes of whoever visits with devotion. According to Fisher's partner Jason Schwartz (they're both brilliant young Sanskrit scholars), this temple was a joint venture among religious communities usually thought to be at odds with each other (Śaivas, Śāktas and Vaiṣṇavas). Furthermore—and this is simply astonishing—all the artisans who made the sculptures had (or were supposed to have had) śaktipāta (spiritual awakening). [See Tantra Illuminated for a full explanation of śaktipāta.] And in this and other Hoysala temples, the image of the deity was consecrated exclusively by practitioners who had experienced advaitācāra: the spiritual experience in which the deity, the mantra, and oneself are all one and the same. The political golden age in Karṇātaka was of course the Vijayanagara empire of the 15th century. The capital of this impressive empire was at Pampā (now Hampi), which features one of the most impressive landscapes of all India. This capital, now in glorious ruins, was so wealthy, clean, and beautiful that 500 years ago it was famous from Europe to China. One Portuguese visitor wrote, "The size of this city I do not write here, because it cannot all be seen from any one spot, but I climbed a hill whence I could see a great part of it; I could not see it all because it lies between several ranges of hills. What I saw from thence seemed to me as large as Rome, and very beautiful to the sight; there are many groves of trees within it, in the gardens of the houses, and many conduits of water which flow into the midst of it, and in places there are lakes; and the king has close to his palace a palm-grove and other rich-bearing fruit-trees. It is the best-provided city in the world..."
A small part of Hampi in NE Karṇātaka. No photo can capture the grandeur of its landscape. Furthermore, spiritual poetry flourished in Karṇātaka, which produced more than its fair share of poet-saints (see below). So you can understand why I am VERY excited indeed to be leading a spiritual pilgrimage to these and other sacred sites around Karṇātaka at the end of this year. On a personal note, my root-guru is from southwest Karṇātaka, and so was her guru. An incredible ancient power center in northern Karṇātaka -- the cave-temples surrounding the lake feature one of the oldest Śiva Naṭarāja-s (Lord of the Dance) in the world. my head a cupola of gold! See-saw watermills bow their heads. Can they read the ways of the Lord? or the stance of their standing? The poetry of the ecstatic female poet-saint, Akka Mahādevī, is even more exquisite, but I'm saving it for the trip! To find out more about this journey of a lifetime, go here. The Virūpāksha Temple in Hampi, which is still functioning today.